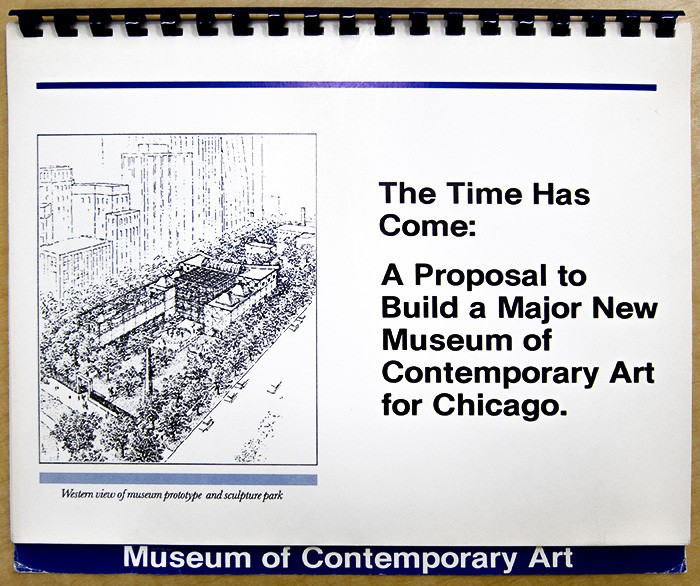 The brochures on this page, presented courtesy of the MCA Library & Archives, show news of the building project as presented to museum members (above) and a binder containing materials to encourage fundraising for the new museum on Block 21. Materials utilized the key phrase, "the time has come," throughout the museum's 55 million dollar fundraising campaign. The initial architectural proposal shows a prototype of a museum and sculpture park that covers more ground than the MCA was eventually allowed to occupy. Local neighborhood groups and a zoning height restriction in 1985 dictated the architect's final site and building design. Ultimately, the MCA was only allowed to build on half the footprint of the Chicago Avenue Armory, and they were restricted to the armory building's height. Neighbor's balked at the suggestion of a loading dock and underground parking facility, complaining that the traffic would change the tone of their front yards. The tabs, above, detail the museum's building process and steps in finding an architect. See the history leading to this process, here.